Cardiff City boss Malky Mackay is "absolutely not" expecting to be targeted for the vacant Crystal Palace role. 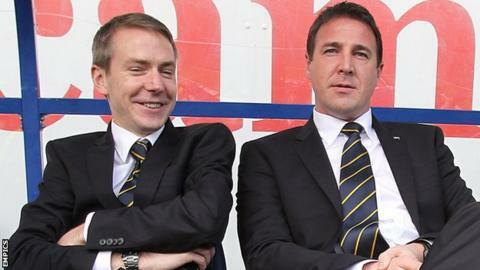 Mackay's former Bluebirds head of recruitment Iain Moody is Palace's new director of football. Moody's controversial departure from Cardiff prompted speculation that Mackay could follow. Mackay said: "I'll not let anything stand in the way of Cardiff City progressing in this league." He also told BBC Radio Wales that he intends "making sure that I'm talking to you about the Premier League next year again". who parted company with in October and the remain bottom of the table. Following the announcement of Moody's appointment, Palace co-chairman Steve Parish said: "Iain is someone whose opinion we'll ask about getting the new manager. "We want to appoint someone quickly but we must get the right person." At Cardiff, Malaysian owner Vincent Tan replaced Moody as head of recruitment with Alisher Apsalyamov, the 23-year-old Kazakh who was at the club on work experience. Apsalyamov has since stepped aside temporarily from his role over a visa issue. Mackay says Palace have recruited wisely in Moody's case. "They've got a very good director of football, very good man that I said at the time on the record our loss will be someone else's gain," said Mackay. "He's had three or four approaches since he left. "He's a good man and he's someone that'll do well for Crystal Palace." The Scotsman says chairman Mehmet Dalman, a merchant banker, who was has a "good, calm vision of our football club going forward". In the wake of their Mackay was upbeat about his side's overall performances following their promotion to the top flight. Leandro Bacuna's spectacular strike broke the deadlock and Libor Kozak added the second. Mackay said: "I'm really disappointed for the team. I said to them I'm sickened for them because I thought we were good value. "At 75 minutes a wonder goal goes in and it's a fantastic free kick. Our wall stood firm and jumped and he's [Bacuna] put it in. "And goals change games. At that point they can sit in and break on the counter and force us to come at them. "But up to that point I thought we were real good value." Mackay added: "I'm delighted the way they've settled the way they have in terms of performances and in the main, results. "We've looked as if we're competent at this level."